Like La Belle Assemblée , Ackermann’s Repository had its own resident “Dear Abby.” Letters from Readers addressed to the Female Tattler poured forth troubles seeking advice, and sometimes advice seeking trouble. These columns are little vignettes of Regency life. Humphrey Sneak’s letter to “Madam” appears in the January, 1818 issue. His trouble was his wife, to whom he had been married not above three years. A termagant, she had plenty of practice at being a shrew; she being, by her own account, forty-two years of age since the year 1804. To begin with, her voice is shrill, and echoes throughout, notwithstanding her husband’s pleas to let their domicile be as silent at noon as it is at midnight. She is a know-it-all–only her opinion is right, and everyone else’s, most particularly her husband’s, is wrong. “Indeed, to say the truth, very few of them stay to be discharged, for she does so tease, harass and abuse them, that they generally discharge themselves. The one maid that did stay on (upwards of seven months) was hard of hearing. When she recovered this faculty, she left after seven days. As for the neighbors, they “return the compliment” when she is rude to them, and avoid her company entirely. She complains she has “no society abroad.” Even worse, she has no companionship at home, for her husband is so ill-natured as to point out she has only herself to blame. This carriage dress, courtesy of Miss McDonald, no. 84 Wells-street, is made of bombazine. The wrapping-cloak is Russian “novel and striking.” The little purse, called a ridicule, is of black velvet. 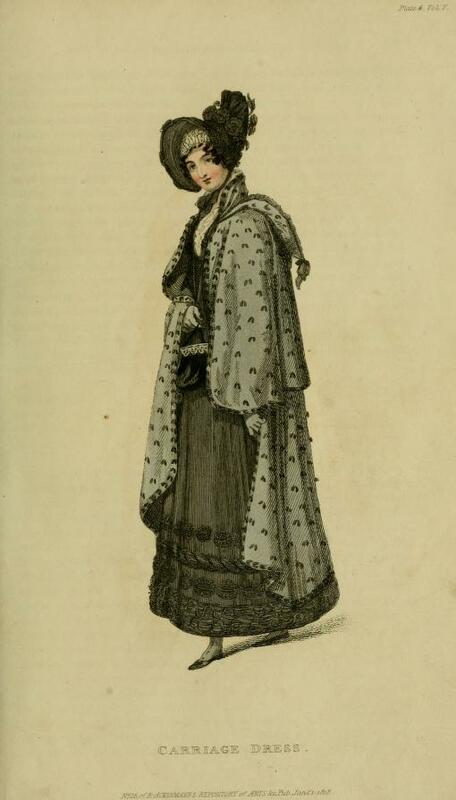 This entry was posted in Regency, Uncategorized and tagged 1818 carriage dress, Ackermann's, Regency marriage, ridicule purse, Russian wrapping cloak, the Female Tattler by Angelyn. Bookmark the permalink. Very entertaining post, Angelyn 🙂 I love the “two possibilities” that the husband mentions! A grim state of affairs indeed. Thanks for the compliment, Mimi~~how one manages to get into such matrimonial scrapes is beyond me!